US President Donald Trump’s State of the Union speech will urge optimism, pulling back from Washington’s current climate of strife, a top official insisted Friday. The president — in open warfare with opposition Democrats, as well as railing almost daily against prosecutors looking at allegations that he colluded with Russia in his 2016 election — will take the high ground, the official said. “Optimistic and unifying, but I think it can also be considered visionary,” the official said of the speech. 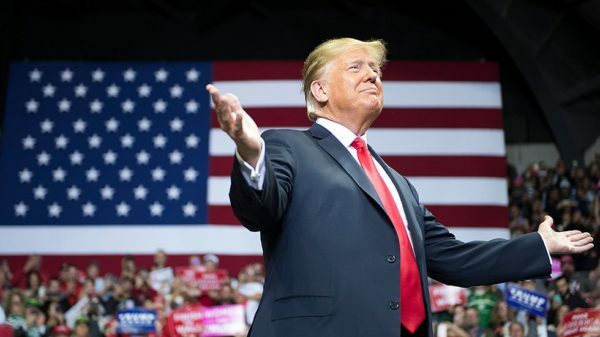 However, the speech is bound to be one of the most politically fraught in years, coming against the backdrop of a bitter row with opposition Democrats who refuse to fund Trump’s plan for more walling along the US-Mexican border. The dispute even led to Congress delaying the date of the speech. And Trump himself hinted Friday that he will use the delayed event to declare a national emergency, allowing himself to unilaterally appropriate wall building funds, bypassing Congress altogether. The senior administration official refused to confirm any specific details of the speech and emphasized that the president’s main goal was to present a more healing tone. – The contentious debate on illegal immigration over the Mexican border. – An “update” on trade negotiations with China and other countries where Trump says he is strengthening markets for US workers. – Asking Congress to approve “substantial investments” on US infrastructure projects. – Lowering sky-high prescription medicine costs. The official refused to give concrete details of policy announcements. However, he did say that Venezuela, where Washington is supporting the opposition’s bid to push out leftist President Nicolas Maduro, would feature. Speaking at the White House, Trump gave his strongest indication yet that he is readying to declare a state of emergency on the border, something that would undoubtedly deepen partisan bickering in Washington. “Listen closely to the State of the Union, I think you’ll find it very exciting,” Trump said.